The Silent Way is a language teaching methodology which was devised by Caleb Gattegno in the 1960s. Gattegno states that “a foreign language can only be learnt in schools by artificial methods, employing materials constructed for the purpose” (Gattegno 1972: preamble). 1. Learning is regarded as a “problem-solving, creative, discovering activity”(Richards & Rodgers 2001: 81), in which the learner rather acts and participates actively than just being passive and doing nothing but listening to the teacher. If the learner is involved directly, he automatically benefits from the so called “discovery learning”. 2. The use of special physical objects such as coloured wooden rods or colour-coded wall charts facilitates learning. These physical objects “provide physical foci for student learning and also create memorable images to facilitate student recall” (Richards & Rodgers 2001: 81). 3. Learning is facilitated by involving the learners and letting them solve problems on their own with the help of the provided materials. Though the Silent Way is not considered to be a teacher-centred approach, the teacher is very much in control of what happens in the class. While the teacher uses mainly gestures and facial expressions to address the learners, his/her main task is the teaching of the language by letting the students express themselves on a variety of subjects and by making their own hypotheses about grammar, pronunciation, style, etc. The teacher's guidance, though silent, is very active. The learners are expected to participate in class actively. They should be willing to make mistakes, to test out the basic language elements via the usage of the materials provided and their motivation is solicited by the constant presentation of problems to be solved. The materials make meaning visible and tangible so Silent Way lessons are usually easily understandable by students. It does require of students that they be willing to take risks and be comfortable about making mistakes which is encouraged by the supportive attitude of the teacher. The coloured wooden rods can be used to represent whole situations in an abstract way. The teacher for example could use the green rods to represent a certain number of people, the red ones to represent cars and a single white rod representing a special character, for instance the teacher himself. The teacher then would probably first point at the white rod and thereafter at himself to show the students the meaning of the rods. The next step would be the presentation of the meanings of the other rods (the green and red ones), and after the students get their meaning, the teacher might present a certain everyday situation with the rods. During this presentation, the teacher may feature certain grammatical aspects of the language and let the students find out about these. Another way to use the rods could simply be the usage of them as representing certain parts of the word order of the language. The students might then test out in which order the rods have to be put, so that the correct form is created. The different charts can be used to teach different aspects of the language. The rectangle chart for instance can be used to show the pronunciation of the phonemes of a language. It contains several different coloured rectangles which represent the various sounds of a language. 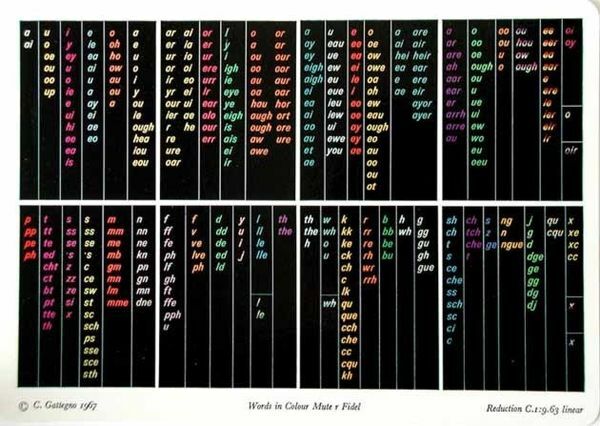 The same colour code which is used in the rectangle chart is also used in the Fidel and the word charts. The Fidel contains several different charts. They present all possible spellings of every single sound of the language. The word charts present the functional words of the language. The use of the Silent Way enables a very high degree of interaction as well between the teacher and the students as between the students themselves and additionally raises the participation of the students in class. The students/learners cooperate and help each other in class and in this way the social aspect of learning is supported. For the students it is beneficial that they are expected to develop a certain degree of self-awareness and that they can discover the language on their own via testing things and making use of the materials provided by the teacher. Just from reading descriptions some people feel the Silent Way is a very abstract way of learning a language and it is true that it is extremely different from more commonly used methods of language learning. Some learners may be put off by this. However most of those who have practical experience of the approach appreciate the way they are given the opportunity to function as autonomous learners. Some have assumed that the Silent Way can only be used in small classes but this is not in fact the case: particularly with beginners, classes of 40 or more have been successful. There is also a certain amount of scepticism on the part of some teachers who doubt the utility of a teaching method in which the teacher apparently says nothing. Gattegno, C. (1963). Teaching foreign languages in schools: The Silent Way New York: Educational Solutions. Richards, J.C. & T.S. Rodgers. 2001. Approaches and Methods in Language Teaching. Cambridge: CUP. Young, R. (1995). Caleb Gattegno's Silent Way: Some of the reasons why we do what we do. Benstein, P. (1996). Explaining concepts behind the Silent Way. This page was last edited on 22 May 2016, at 00:27.